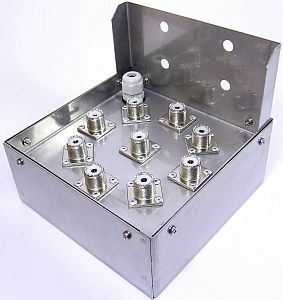 8 to 1 antenna switch for outdoor installation. The switch can handle 2000W up to 30MHz. Unused antenna inputs are grounded. The weatherproof outdoor unit is in a stainless steel housing. For the connection between the controller and the outdoor unit a 9-pin cable is required. 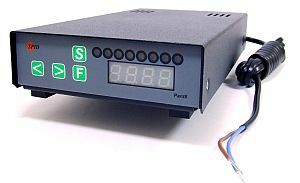 The controller can be connected directly to the station power supply. The manual switching is done simply by a short press on the button in front of the controller. This remote switch can be operated fully automatically. For this purpose, the controller has two ports on the back panel. One is a 25-pin printer port for direct connection and control via the PC (automatically by the provided and included software "SPIDLog") and the other is a USB interface. This interface is not only for a PC, the switch can also be controlled directly by a transceiver. In this case, the switch can automatically select depending on the preset band the antenna port. In addition to automatic and manual switching, the selection of connection can also be done by an mouse (included). For this, a separate port is provided at the rear of the controller.